I recently noticed an advertiser taking out an ad on one of my sidebars recently and checked them out on a whim. 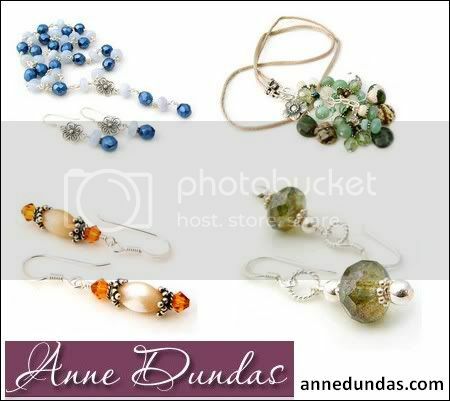 The jewellery designer is Anne Dundas from Sydney Australia and something about her handworked designs called out to me. That and her End of Financial Year sale of up to 70% of course! I was pretty taken with the stuff I saw and purchased a necklace and a necklace/earrings set for a total of AUD61+ (US$60+) inclusive of shipping. Shipping to Malaysia for the 2 items came up to AUD3.85 which I found reasonable. I wanted to show the pictures of what I bought, but they have disappeared from the site! I guess this truly indicates that the designs featured are one of a kind and once its gone, its gone. That’s nice. I’ve never really had a one-of-a-kind piece of jewellery before 🙂 So, I’ll take pictures when it gets here. I would say that some of the jewellery is quite cheap after the 70% discount and if you have spare funds in Paypal, its a good way to spend it because she takes Paypal. I don’t get anything for this pimping (she doesn’t even know I’m writing about her!) so nope, I don’t benefit one bit from spreading the word! The 70% off sale is on until June 30.
woww.. i jz checked on her website, and most of her jewellery are really nice and cheap (after discount of course). and the shipping from syd to malaysia is very cheap indeed..! Oh wow! I was just checking my website stat’s and noticed the link coming from here so thought I’d check it out. This has really made my day!! Rinnah: Anne has kindly provided a link below! Anne: How did you find me! I love most of your designs – very whimsical and pretty. I can’t wait till my stuff gets here 🙂 All the best!